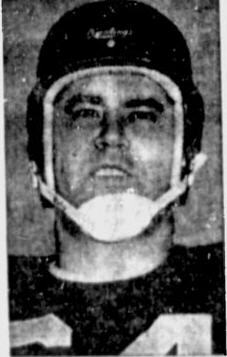 Juan Sheridan was born in Havana Cuba and played nine seasons for the Montreal Alouettes at Tackle and Middle Guard from 1949 to 1957. During World War II, with most of the civilian teams suspending play, Sheridan played for the Montreal Navy team that won a Grey Cup in 1944. After the war, Sheridan joined the Toronto Indians of the ORFU for two seasons (1946 and 1947) then played with Toronto Balmby Beach when the Beaches and the Indians merged in 1948*. In 1949, Sheridan joined the Alouettes and won his second Grey Cup as the Larks defeated Calgary 28-15. Juan Sheridan passed away from a heart attack on October 7, 1969. There were no official games played stats kept in the East until 1960. These numbers come from the 2004 Montreal Media Guide and are unofficial.